Ping is so simple and so useful. In previous posts we mentioned ping a couple of times and the good work it does. The fact that ping has not changed much over the last 20+ years means it is on the right track. Now, what if you had that precious little tool with you all the time? You can check the availability of any network hardware on the Internet in a matter of seconds. Ping is now widely available for mobile phones and it doesn't matter whether you are a devoted iPhone user, Nokia lover or Android hugger. 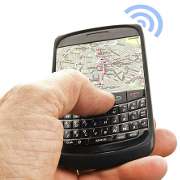 There is a ping tool available for all popular mobile phone platforms. This piece of software should have really been called iPing, but that is just me. iMobile Apps have developed a ping tool for Android too. Like described in the comment section - "It just works!" Now you have the power of ping stashed away in your pocket, ready to diagnose and ensure that the host computer you are trying to reach is actually operating, the host computer being your home PC, web server or any other hardware directly connected to the Internet. This is only one way to find out if a network resource you count on is down or not, for more complex and versatile solutions you can try out some of our tools.